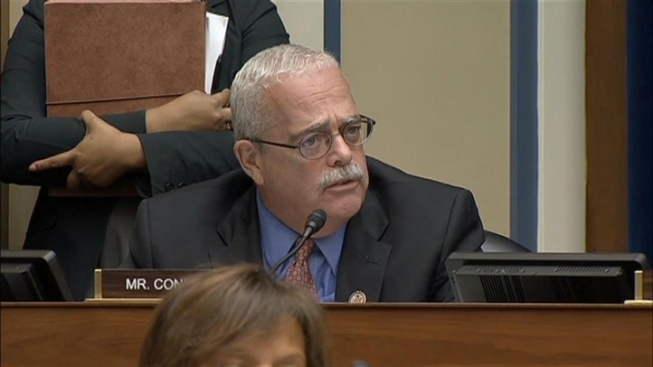 U.S. Rep. Gerry Connolly, D-Va., tried to mock Republican attacks on an IRS official testifying before the House Oversight and Government Reform Committee Wednesday. Some Republicans have been hammering Sarah Hall Ingram for months. She once headed the IRS division that targeted conservative political groups for extra scrutiny when they applied for tax-exempt status. Connolly oddly asked Ingram if she'd ever read "The Crucible" by Arthur Miller. Ingram: I've not read it. I've seen it performed. Connolly: And you know what it's about. Connolly: What is it about? Ingram: Well, I'm from New England so I'm familiar with the original story. It's about the Salem witch trial. Connolly: You're under oath. Have you been consorting with the devil? Ingram: Not to my knowledge, sir. Connolly: Are reports that you can fly accurate? Ingram: Uh, greatly exaggerated, sir. Connolly: Have you been involved, in any way, in trying to pervert our youth in Salem or anywhere else? Ingram: I certainly hope not, sir.